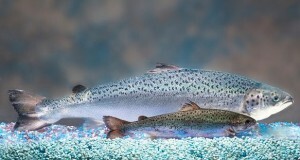 WASHINGTON, DC – Consumers Union, the policy and advocacy arm of Consumer Reports, today expressed deep disappointment as the FDA approved AquaBounty Technologies’ application for AquAdvantage Salmon, the first genetically engineered (GE) food animal on the market that is designed to grow to maturity in half the time of wild salmon. The agency is not requiring that the GE salmon be labeled as such, only issuing guidance for voluntary labeling of genetically engineered salmon and plants. Consumers Union has commented at length to FDA about what it feels were inadequacies in both the agencies human and environmental safety assessments. The group pointed to potential issues of increased allergenicity, as well as the potential for fish to escape from the hatchery and production facility as concerns. The consumer group also pointed to today’s decision as even more cause for Congress to take steps requiring labeling for genetically engineered foods. Unfortunately, earlier this year, the House passed legislation that would prohibit mandatory labeling of genetically modified food. The Senate is currently working on legislation to address the issue. Consumers Union is urging lawmakers to support a strong bill that calls for meaningful national labeling that includes clear and straightforward text, not a code that must be scanned.